The National Hurricane Center updated that a tropical depression strengthened into Tropical Storm Beryl on Thursday afternoon. Beryl had winds of 40 mph on Thursday mid-afternoon and was traveling to the west at 16 mph. It was located about 1,330 miles east-southeast of the Lesser Antilles, a chain of islands in the eastern Caribbean Sea. 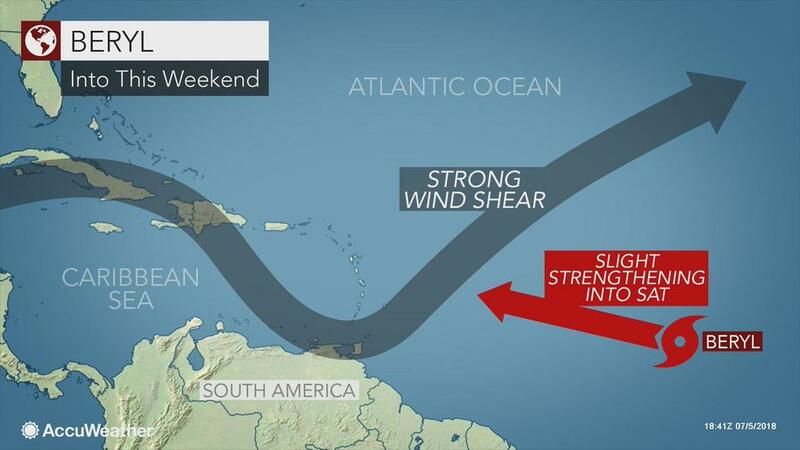 AcuWeather said, however, that the storm should fall apart by the time it arrives at the Lesser Antilles, due to strong wind shear, dry air, and dust, which should all contribute to weakening the system. i hope it kills all the sub-human Haitians. I'm not saying they're wrong, but the same prediction was made of Hurricane Andrew when I was a kid.